A guidebook for faculty planning on, or interested in, using Turning Technology student response devices in their class. Includes some tips and tricks for getting started and examples of polling options provided by the TurningPoint plug-in. TurningPoint AnyWhere, ResponseCard AnyWhere, and report generation are also discussed. 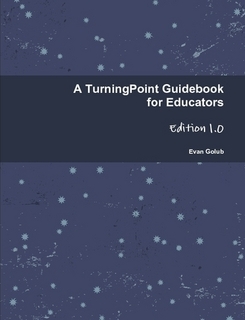 A free PDF version of this guidebook can be downloaded from Lulu Enterprises Inc.
Chapter I: So you want to use TurningPoint and clickers? Section 2: Defining your goals. Section 3: Updating your syllabus. Section 4: Preparing for, and adapting to, glitches. Chapter II: Checking your gear, their clickers. Section 1: Checking that your computer is properly configured for authoring. Section 2: Checking that your computer is properly configured for live RF polling. Section 3: Checking that your computer is properly configured for RWW polling. Section 4: Having your students set and use their hardware and/or software clickers. Section 5: Preparing to work with your data. Section 6: Tips for working at home (without a receiver and/or without clickers). Chapter III: Creating some basic slides. Section 2: Likert Scale slides and Multiple Choice slides. Section 3: Inserting slides on the fly. Section 4: Marking an answer as the correct one. Chapter IV: Slides that allow multiple votes. Section 1: Allowing multiple votes. Section 2: Multiple votes with repeats allowed. Chapter V: Comparisons, branches, demographics, and multi-day sessions. Section 1: Comparing multiple polls. Section 3: Demographic-based voting displays. Section 4: Multi-day session use. Chapter VI: Dial sessions, ice-breakers, and fast fingers. Section 2: Ice Breaker slides. Section 3: Fastest Responders slides. Chapter VII: Anonymous sessions and slides. Section 1: TurningPoint AnyWhere questions and polling. Section 2: TurningPoint AnyWhere reports. Chapter IX: Extracting TurningPoint data to spreadsheet reports. Section 1: Results by question. Section 3: Results by participant. This page last modified on Wednesday, 09-Jan-2013 12:02:36 EST.